With sandy beaches, quaint inns, world class restaurants, and almost 400 miles of shoreline, little Rhode Island is a giant among New England's summer fun destinations. Top beach areas throughout the Ocean State include Roger Wheeler State Beach and Scarborough Beach (the state's busiest) in Narragansett, where you can watch the ferries making their run out to Crescent Beach on Block Island, often rated as one of New England's very best. • Have your shovels ready: A month before his capture in Boston in 1699, infamous pirate Captain Kidd visited Block Island off the Rhode Island coast. 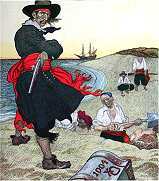 To this day, the story is told about his treasure of gold and silver being buried somewhere along the island's shores. • Cleverly named by locals, Reject's Beach isn't an official public beach, but it is a portion of the shore unwanted by the Newport elite who frequent the exclusive and private Bailey's Beach next door. • Narragansett Beach is often regarded as having the best surfing in New England. Visit Rhode Island : Beaches - Check out an excellent, concise guide to fun-in- the-sun with photos, map and links to major beaches along the Atlantic plus a spotlight on suggested favorites, including Block Island's Crescent Beach. Rhode Island State Parks - Check out easy browsing with the entire list of state-run beaches from Burlingame to Scarborough State Beach with photos, directions, fees and contact info. South County, Rhode Island - Find info on 100 miles of beachfront including things to do, event calendar, lodging and dining, directions, FAQ, photo tour. .
Rhode Island Lights - Lighthouse fans can discover brief histories and directions to Point Judith, Watch Hill, Castle Hill, Beavertail Light, Rose Island Light, and the Southeast and North Lighthouses on Block Island.